The Canon Rebel T2i 550D is a relatively minor upgrade over its predecessor, the Rebel T1i 500D. In short, the main improvements that are made in this new model are upgrades to the sensor. 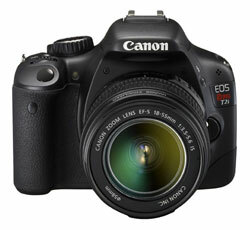 The T2i 550D borrows the sensor from a much more expensive camera: the Canon 7D. This improved sensor has a sophisticated metering system that's designed to improve exposures no matter what the available light might be. The sensor is also designed to work better under low-light conditions: this means that you should see less noise at high ISO settings when you take pictures with the 550D. Finally, video enthusiasts will be happy to hear that they now get control over exposure (aperture and shutter speed) in movie mode, and they can leverage a jack to connect a stereo microphone for improved audio quality.